Spin The World Video Slot Guide & Review - Casino Answers! 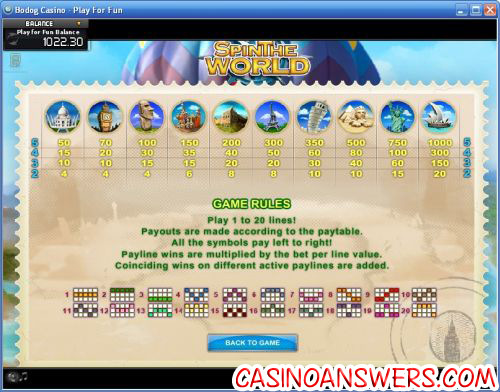 Spin the World is a 5-reel, 20-line video slot from the CTXM software provider and can be played at Bovada Casino. Spin the World is tourist-themed video slot. The symbols are many of the different sights from across the globe. 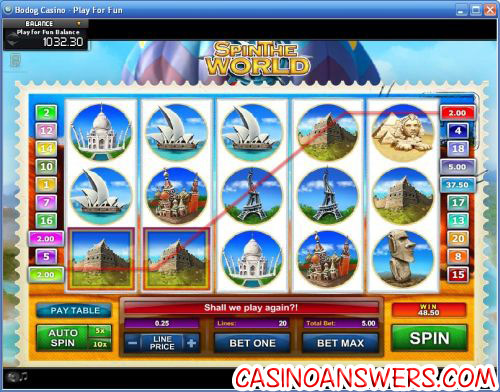 Symbols in the Spin the World video slot are: Taj Mahal (India), Big Ben (London), Moai (Easter Island), Red Square (Moscow), Great Wall of China, Eiffel Tower (Paris), Leaning Tower of Piza, The Great Sphinx (Cairo), Statue of Liberty (New York City) and Sydney Opera House. The symbols all appear in caricature form, giving the slot the fun cartoonish feel that we all love in video slots. Also adding to the theme is the background of a hot air balloon as well as the stamp that the video slot appears on. When you spin the reels, a tune will play. If you hit a winning combination, a different tune will sound to celebrate your win. Bet denominations on Spin the World are: $0.05, $0.10, $0.25, $0.50, $1, $2 and $5. To save you from doing the math, the minimum bet on all 20 lines is $1 and the maximum bet is $100. Spin the World is suitable for low or high stakes players. We suggest that you keep all 20 paylines active when you play Spin the World, as you don’t want to miss out on any potential big wins. Spin the World has a simple autoplay feature. There are two buttons that you can use to quickly select 5 or 10 spins to play automatically, or you can hit the “Auto Spin” button and play 20, 50 or 100 spins automatically as well. Spin the World lacks a lot of the special features of most of the other video slots around. It doesn’t have wild or scatter symbols, there is no bonus game and no progressive jackpot. If you can get past those notable exclusions, you’ll enjoy playing Spin the World at Bovada Casino. Can US players play the Spin World video slot? Absolutely. Bovada Casino is open to players from the United States. Does Spin the World have a progressive jackpot? Spin the World does not have a progressive jackpot. If you’re looking for a progressive jackpot slot, CTXM has three at the time of this writing: Fruit Salad Jackpot, Gold in Bars and Hot 7’s. These three progressive jackpot slots and more can be played at Bovada Casino. How come I can’t find Spin the World at my favourite RTG casino? While Bovada is a Realtime Gaming online casino, it also has independently added CTXM games to beef up its game selection. There aren’t very many casinos that have CTXM games like Spin the World yet, but Bovada Casino is the best one. Where can I play the Spin The World Slot Machine Game? What is a CTXM game?